Well, here we are mid-way through the summer, and 2018 is flying right by us! God has been doing great things in our midst, and we can’t wait to see what He will do next. The 2018 international water well missions have been amazing! God has allowed HOG to drill four wells. We have had so many supporters inside and outside of our congregation give towards this opportunity that literally saves lives and generations of people in India, Honduras and Cambodia. THANK YOU GOD! As important as it is to meet people’s physical needs, the real need that is obvious throughout the world is the Good News of Jesus Christ. Sharing the love of Christ in everything we do – whether it be well missions or other regional and local missions – is what being a “Christian” is all about. One of my personal favorite ministries is Church under the Bridge (CUB). For several years now, the Lord has used Hope House and HOG to love on the homeless. Once a month on a Sunday morning, we load our supplies, head to Austin where we have the privilege to nurse the homeless community’s feet. It has been said by many and even statistically speaking, that foot care is the second greatest physical need for the homeless (the first being teeth which we are not currently qualified to do J). I have personally met hundreds of people on the streets of Austin, and they have taught me so much. God has really opened my eyes and my heart to view the homeless in a way that I never saw before. God desires for us to love as He loves, to see as He sees, to give as He gives. God has also given me insight to the reality of the many different reasons people are without a home. One of the very sad statistics is that over 50% of the Austin homeless community came out of our foster care system. The fact that so many were either removed from their family or left by their family breaks my heart and really helped me understand the state of our broken society in general. 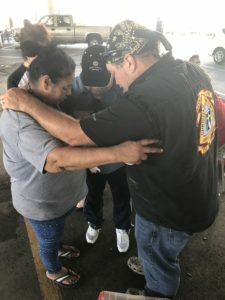 The next time we look away when we see the homeless, we may be looking away from a God appointment that could very well change our lives…and theirs. Another PRAISE REPORT is what God has done and is currently doing in LaGrange. It’s been almost a year since the floodwaters of Hurricane Harvey changed the lives of hundreds of people. From those who suffered loss to those who are helping rebuild what was lost, LaGrange is a community that has seen the hand of God move in many ways. We are very fortunate to have been a part of something so beautiful. Yes, a storm shook the town and took from people possessions that were passed down and/or that people worked years to gain. However, out of every storm comes blessing! And, as always, the Body of Christ rose up to the occasion. There are so many testimonies of lives that were touched and changed for the better. Salvation is the biggest testimony! Getting a new home is awesome, but surrendering your life to Christ is priceless! Please continue to pray for LaGrange and all the families that are still to this day displaced. In closing, 2018 has been an amazing year! God has redeemed, restored, healed and provided for so many people that God has placed in our path. We praise God for His faithfulness! He is the same yesterday, today and forever!